The good news is that a very small percentage of individuals or businesses will be audited in any calendar year. For most, the chance is less than 1%. However, it is vital that taxpayers know certain things about their tax profile that is likely to make them a target for an audit. These taxpayers must be especially diligent in their record-keeping and their preparation for a possible audit or even an IRS investigation. It is also essential that such taxpayers have an existing relationship with an expert tax attorney. If you work for an employer who provides you with a W-9 form, the IRS also receives a copy of that form. The IRS also receives copies of any 1099s you may receive from working as an independent contractor. Thus, IRS is likely to take notice if you fail to accurately report these figures on your tax return. Even though only about 1% of the population is audited each year, statistics from 2012 and earlier years demonstrate that higher earners are more likely to be audited than those with lower incomes. In 2012, taxpayers earning more than $200,000 per year had an audit rate of approximately 4%. For taxpayers whose income is over $5 million, that percentage increases to 21% and 30% for taxpayers earning more than $10 million. More than ever in recent years, the IRS has increased scrutiny on taxpayers who have foreign bank accounts and assets. The IRS has a voluntary disclosure program with offshore accounts, however they have made punishing those who fail to disclose the existence of foreign bank accounts and assets a top priority. When the charitable deductions are disproportionately large compared to income, it will typically raises a red flag with the IRS. If you report high charitable deductions, you should make sure that you have the required documentation to back up those figures. Taxpayers claiming the Home Office Deduction, deducting business meals, travel, entertainment, and/or deducting a very high percentage of vehicle expenses for business use need to be prepared to defend their deductions with precision. The assistance of a tax professional will likely be required, and large deductions of this type are easily spotted and less easily defended. To lawfully take advantage of the home office deduction requires a home office space which is used exclusively and regularly as a principal place of business. Only those expenses that directly apply to the part of the home used as an office can be claimed. Because this is a rule that is often broken, either intentionally or by misinterpretation, it can raise a red flag at the IRS whenever a home office deduction is taken. It is extremely rare for an individual taxpayer to use a vehicle 100% of the time for business use, and the IRS knows this. Form 4562 is provided by the IRS, and it instructs a taxpayer to show only the percentage time/distance a vehicle was used for business purposes during the year. A detailed mileage log and calendar entries listing the purpose of every road trip taken are essential if these deductions are to be taken. Large deductions for business meals, travel and entertainment are also red flags for an IRS auditor. The deductions for meals, travel, and entertainment come with strict rules regarding substantiation, and it is a safe bet that if you skirt the rules the IRS will take note. Detailed records including the date, location, and business purpose of the expenditure are required for all deductions taken. 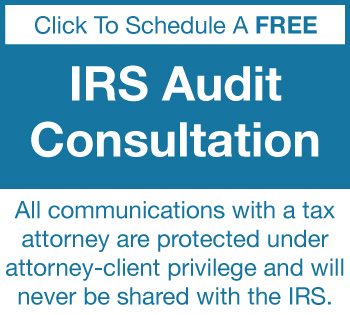 When a tax attorney or tax preparer is not to be trusted, it is likely that the IRS knows who they are. Taxpayers must be wary of tax attorneys or tax preparers who make unrealistic boasts or promises. Sketchy tax professionals are by definition more likely to have been formally disciplined and are sometimes brought to the attention of the IRS by a tip from someone they crossed. As the cliche goes, if it seems to good to be true, it probably is. Although use of credit and debit cards - and even smartphones - to conduct financial transactions seems ubiquitous, there are still some businesses where cash is king. This is often unavoidable for a business, but regrettably cash businesses are almost always red flagged. Businesses such as street vendors, laundromats, and bars will always have a larger part of their income as relatively untraceable cash. Thus, the IRS often targets small business owners whose business is primarily cash-based. Owners of these small cash-based businesses often fail to accurately report all their taxable income, making the IRS much more interested in their tax returns. It is crucial that cash-based businesses keep excellent records and receipts, and have the guidance of an experienced tax professional. If the deductions on your return are disproportionately large compared to a taxpayer’s income, the IRS will take note. It is wise to make keep deductions reasonable in light of one’s taxable income as a whole, unless there is substantial documentation to support large deductions. A taxpayer taking large deductions must be prepared to demonstrate entitlement to the deductions in an audit. Most tax returns, even very simple ones, are typed or printed on a computer. Those done by hand must be done neatly. If a tax return is illegible, has multiple typos, mathematical errors, or is generally sloppy, it will catch the eye of a reviewer, because it stands out from the rest. IRS auditors are suspicious of large rental losses, especially for high earners or those who might be considered “real estate experts.” Only several years ago, the IRS formed a real estate professional audit project, but it has resulted in a significant number of taxpayers being audited. In order to satisfy the rules of claiming rental losses without limitation, a taxpayer must spend more than 50% of their working hours, and more than 750 hours each year “materially participating” in real estate as a developer, broker, or a landlord. Being audited by the IRS is a frightening and intimidating process. An experienced tax attorney can minimize your risks of being audited by advising how to avoid creating red flags on your tax return. The Tax Lawyer - William D Hartsock has been helping clients avoid IRS tax audits since the early 1980's. Mr. Hartsock offers free consultations with the full benefit and protections of attorney client privilege. Call or fill out the form on this page today to schedule your free consultation.